By September of 1984, the development of the Labyrinth screenplay was well underway. Starting with a story by Jim and Dennis Lee (who was also the lyricist for Fraggle Rock), Terry Jones and Laura Phillips each wrote a script. The September 24th meeting (on Jim’s 48th birthday) was an all day affair arranged to discuss Laura’s draft. 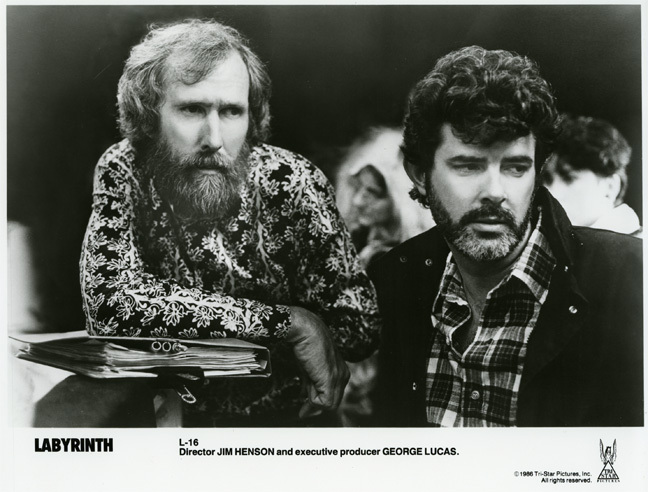 Along with Jim and Laura, the group included George Lucas, producer of the film, Larry Mirkin, producer of Fraggle Rock and The Jim Henson Hour and consultant on numerous Henson projects, and Mira Velimirovich, Jim’s assistant. According to Larry Mirkin, much of the talk focused on Sarah’s emotional journey, as detailed in Laura Phillips’s script. The goal was to incorporate Sarah’s inner growth into the various episodic set pieces associated with the film, such as the Escher room and Jareth’s glass ball juggling, that were the heart of Terry Jones’s script. What followed was a combined script, more meetings, and Jim’s solicitation of script notes from a wide range of people. The final shooting script was ready for the first day of shooting – April 15, 1985. While Terry Jones ultimately got credit for the script, Laura Phillips’s contributions were acknowledged at the end of the film. 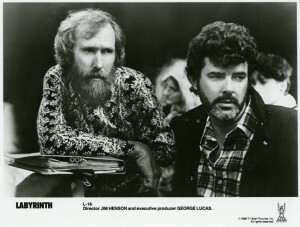 Press photo of Jim Henson and George Lucas on the set of Labyrinth, 1985. Jim is leaning on his much annotated script. This entry was posted in 09-September '84, 1984, Labyrinth and tagged Labyrinth, Larry Mirkin, Lucas. Bookmark the permalink.